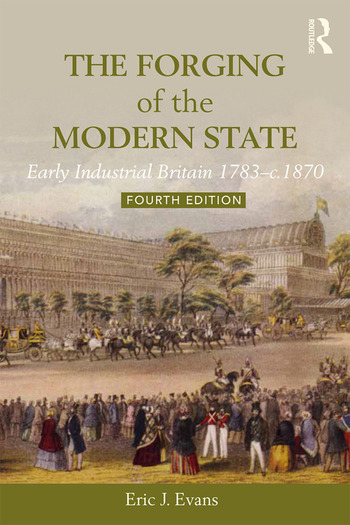 In what has established itself as a classic study of Britain from the late eighteenth century to the mid-Victorian period, Eric J. Evans explains how the country became the world’s first industrial nation. His book also explains how, and why, Britain was able to lay the foundations for what became the world’s largest empire. Over the period covered by this book, Britain became the world’s most powerful nation and arguably its first super-power. Economic opportunity and imperial expansion were accompanied by numerous domestic political crises which stopped short of revolution. The book ranges widely: across key political, diplomatic, social, cultural, economic and religious themes in order to convey the drama involved in a century of hectic, but generally constructive, change. Britain was still ruled by wealthy landowners in 1870 as it had been in 1783, yet the society over which they presided was unrecognisable. Victorian Britain had become an urban, industrial and commercial powerhouse. This fourth edition, coming more than fifteen years after its predecessor, has been completely revised and updated in the light of recent research. It engages more extensively with key themes, including gender, national identities and Britain’s relationship with its burgeoning empire. Containing illustrations, maps, an expanded ‘Framework of Events’ and an extensive ‘Compendium of Information’ on topics such as population change, cabinet membership and significant legislation, the book is essential reading for all students of this crucial period in British history. Eric J. Evans is Emeritus Professor of Modern History at Lancaster University. He is the author of a number of seminal works on the political and social history of eighteenth and nineteenth-century Britain.